Online Plus Edition. Professional, elegant and surprisingly simple. 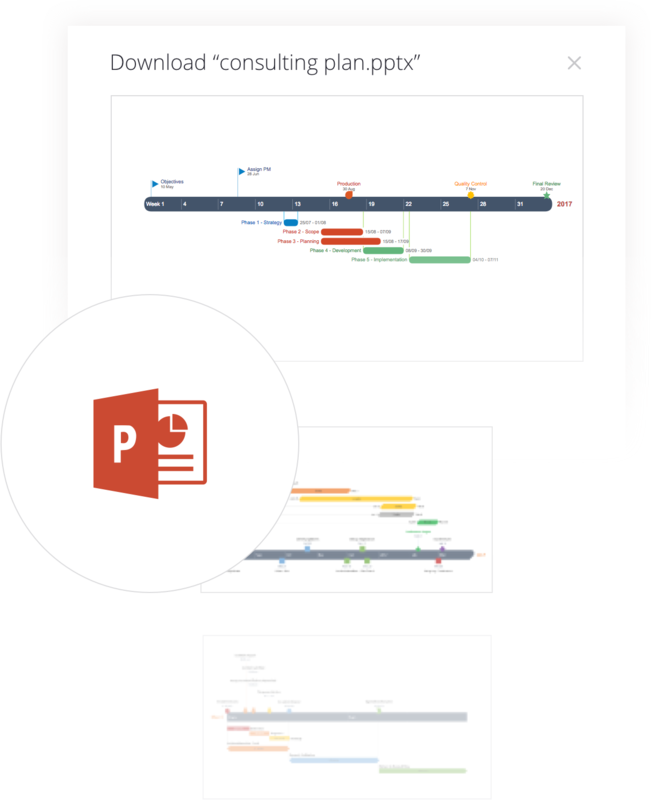 The Online Plus Edition quickly creates PowerPoint timelines that are easy to manage, export and share …right from your browser. 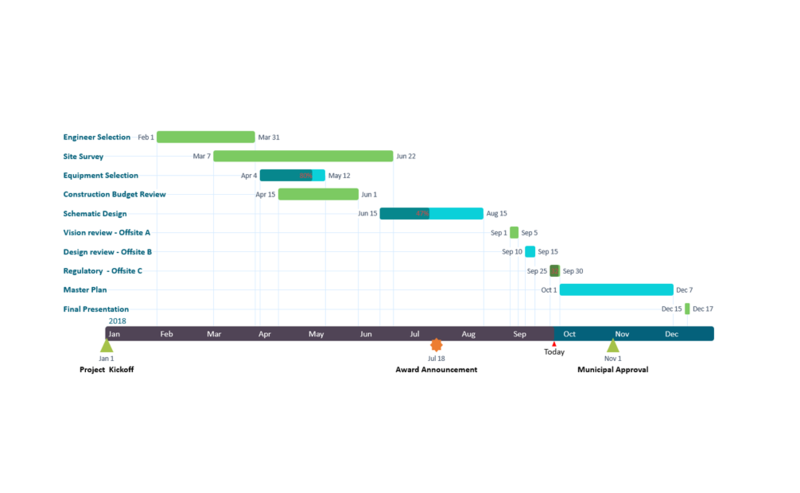 As a Project Manager in a global organization, I need to create and share the high-level schedules of my projects with many stakeholders and need them to be self-explanatory, easy-to-read and understandable. For this I required an online tool that was fast, and simple to edit or update. Office Timeline Online hit the mark for both these needs and I would strongly recommend it to anyone who has to create project schedules for executive audiences. Simplicity drives efficiency and Office Timeline Online does exactly that. I have been using it for the past 1 year and it has helped me deliver better customer presentations, far more efficiently than any other tool. It is now an integral part of my daily work and I cannot do without it. Import your most important Excel data. 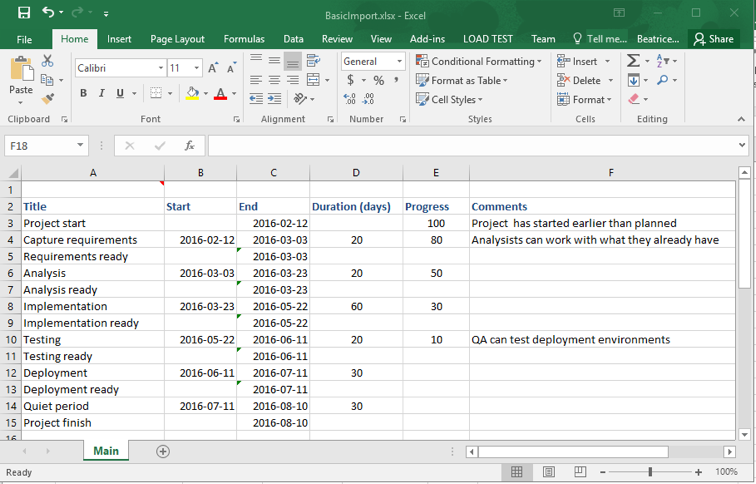 Plus Edition lets you import up to 150 rows of data from Excel without restriction. 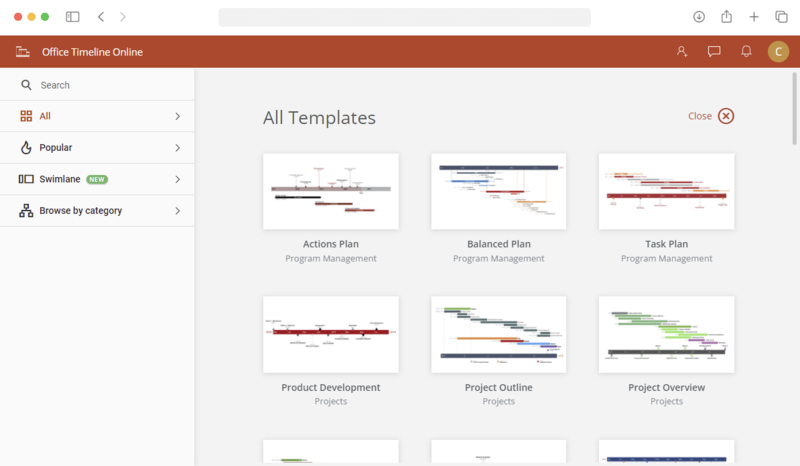 Use it to generate in-depth visual plans in seconds. Save time with Plus Edition’s online template gallery. 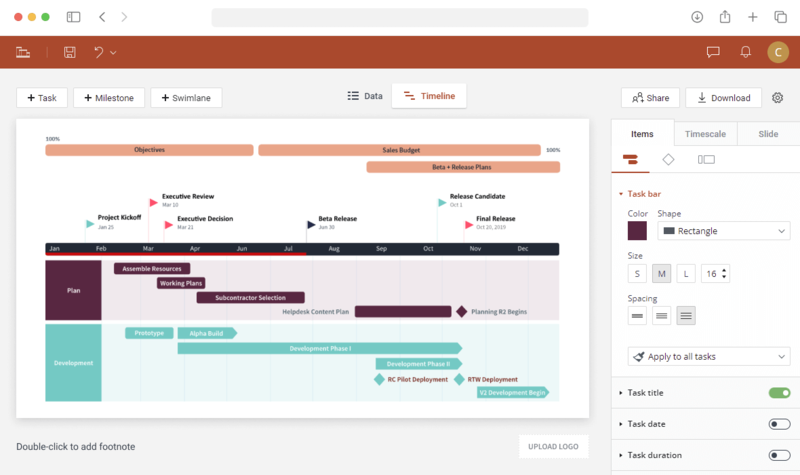 Choose from a variety of stylish templates in categories like Roadmaps, Pharmaceutical, Project, IT, or Software Development. 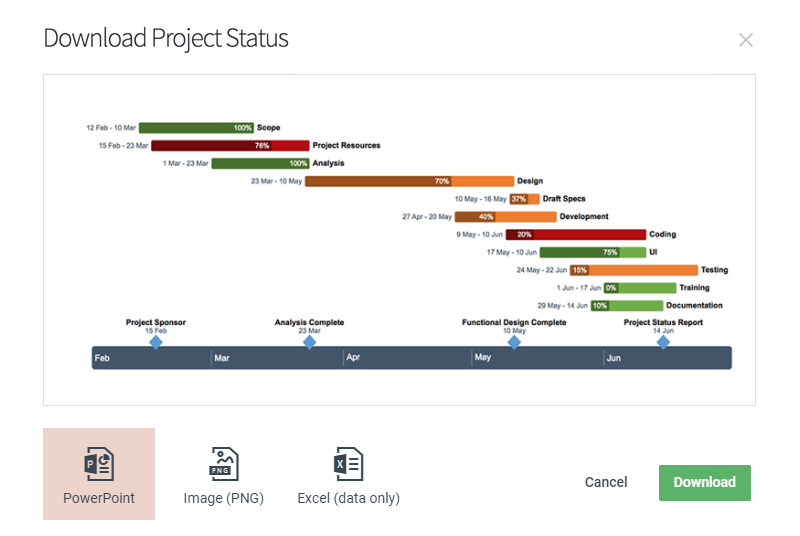 Unlimited timelines and Gantt charts in the cloud. Plus Edition lets you save an unlimited number of timelines online so you can easily update and share them wherever and whenever you need them. With the web app’s secure storage, you know your data is protected and that you never risk losing work. Download as many PowerPoint timelines as needed. The Online Plus Edition lets you download an unlimited number of PowerPoint slides. This means you can easily include them in any presentation and communicate your project plan in a familiar way. Build unique, detailed timelines as fast as you need them. 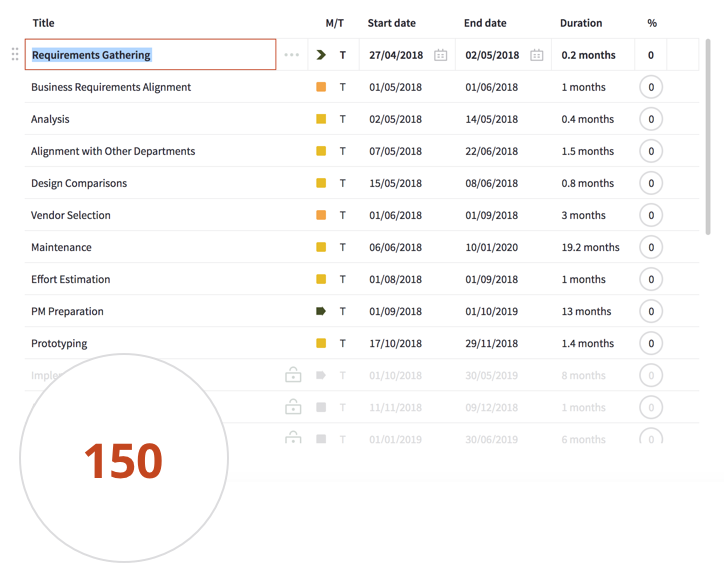 Enter up to 150 rows of data to create stunning timelines and communicate the right amount of detail to teams, clients and managers. 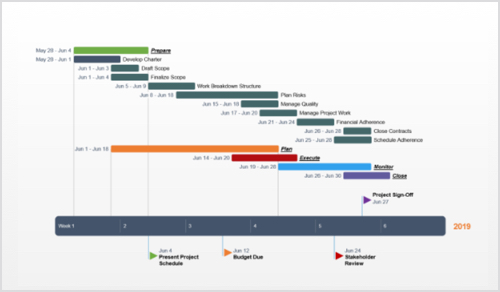 Does your project schedule fall outside of the typical work week? 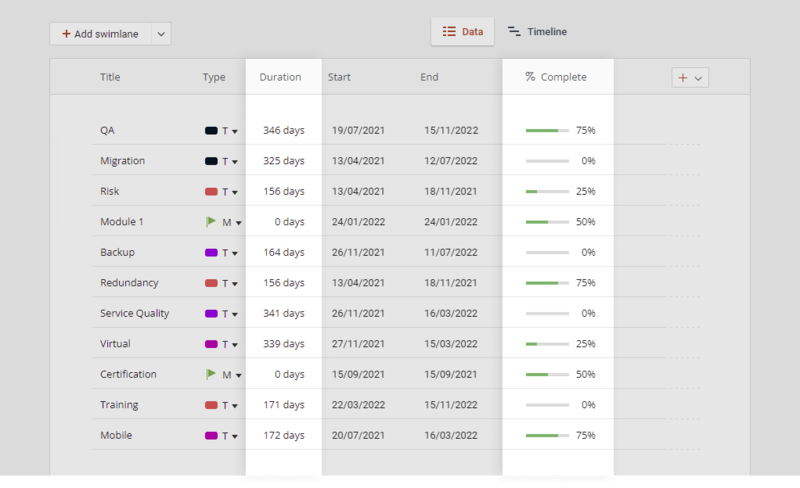 Plus Edition lets you specify your team's exact working days for precise planning. Use drag & drop or the intuitive Style Pane to instantly adjust the size and spacing of your tasks for a better fit. 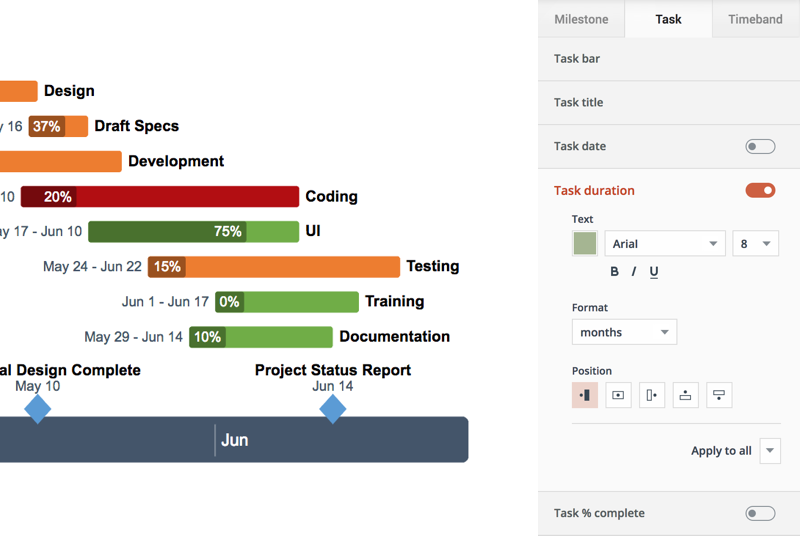 Display critical details such as task duration or percentage complete to give clients and execs a clear view of your project’s progress. Use the powerful Style Pane to customize any detail on your timeline and convey your message the right way. 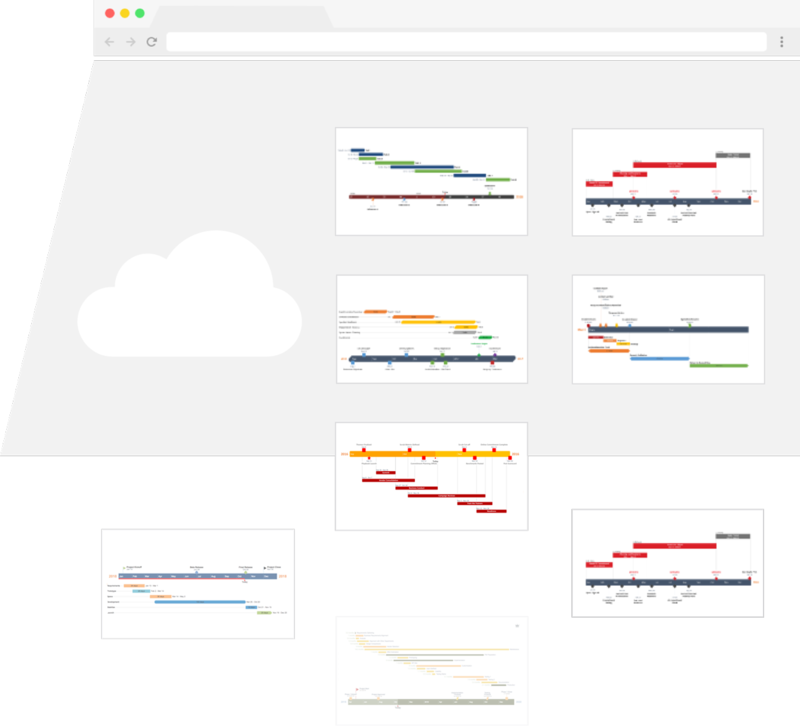 Download your timeline as a PowerPoint slide, PNG image or Excel schedule. Number of timelines you can save Save your timelines in the cloud to access them anytime, anywhere. Number of PPT downloads /month Download your timelines as PowerPoint slides for important presentations. Number of .png downloads /month Download your timelines as .png files for quick printing and sharing. Number of records you can import from Excel Quickly import project data from Excel and save time. Number of records you can enter manually Enter up to 150 rows of data to create detailed, easy-to-understand timelines. 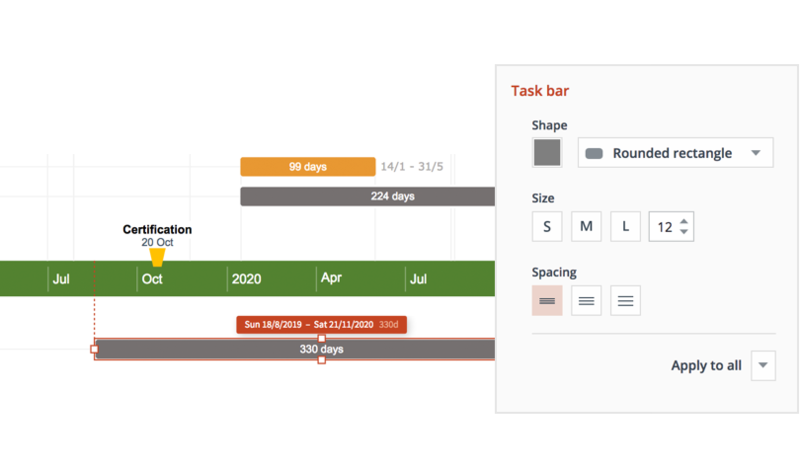 Drag & drop tasks and milestones Drag tasks and milestones in Timeline View to reposition or resize them on the fly. Milestone & task shapes Add logic and meaning to your timelines with distinctive shapes. Custom-position your timeline Drag & drop the timeband to reposition timelines higher or lower on the slide for the perfect fit. 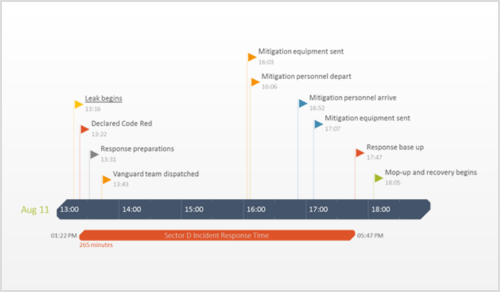 Add & complete & task duration Present vital details teams, clients and execs need to know. Color fonts and shapes Style every detail to create beautiful visuals that stand out. 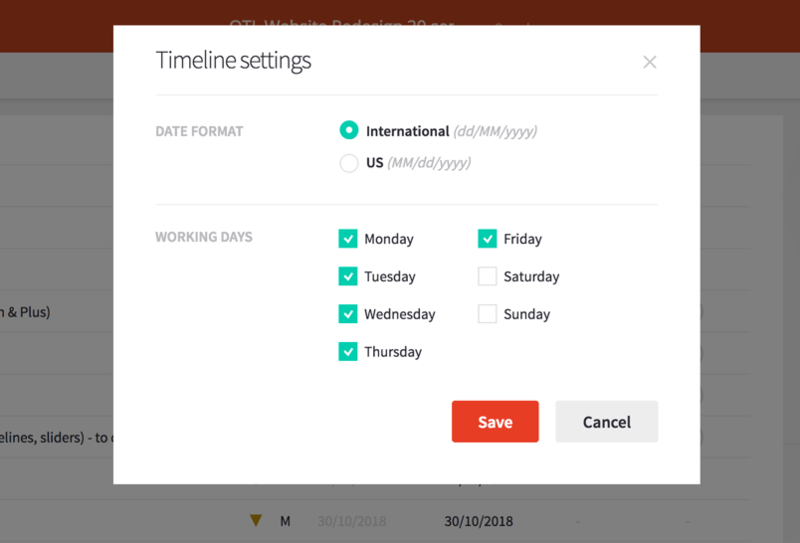 Date formats Choose your preferred date format to deliver clarity. Technical support Get free assistance from our responsive support center whenever you need it. Unlimited free updates Always get the latest features and enhancements free of charge.